Our new wallpaper looks amazing with bold patterns, but if that isn’t your usual forté, it can seem a bit overwhelming. Thankfully, top-seller Mark Ashkenazi is here to give you a step-by-step walkthrough on how to easily create a repeating pattern that will look great on wallpaper and more! Creating a repeating pattern that doesn’t look obvious may seem like an arduous task, but it is not as complicated as it looks. With Photoshop and a little patience, you can turn a drawing into a repeating pattern! Step 1. First, you’ll need to create a base drawing for your repeating background—draw anything you want, but the key is to make sure that nothing touches the edges of the paper. Step 2. Scan the drawing to upload it to Photoshop. Step 3. Once uploaded, remove white background of your drawing by using the magic wand tool. Step 4. Open a new project (size 2000 w x 2000 h res 72) and then open a new layer. Delete the original layer. Step 5. 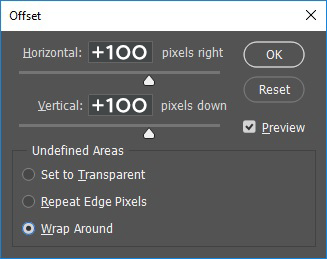 Drag in your drawing and navigate to Filter > Other > Offset. Type your width offset in the horizontal box, and the height offset in the vertical box. if the middle looks empty, fill it by dragging in another item. Step 6. You’re almost done, but you’ll want to test that the pattern repeats nicely. Select the entire drawing by pressing CTRL-A, or navigate to Select > All. Navigate to Edit > Define Pattern and name the pattern whatever you’d like. Step 7. Create a new, large document to test the pattern in. You’ll want it to be at least four times as large as your design. I chose 6000×6000 pixels. Step 8. Select the paint bucket tool. Make sure that the drop down choice is “Pattern,” not “Foreground.” Your new pattern should be among the patterns in the palette. Choose it, then click anywhere on your canvas to fill your screen. You can test out your pattern and watch for any obvious gaps or other weirdness. Be sure to pan the image, zoom in and out, and really look at what you’ve created. You can discard the test canvas and save the design as a high quality JPG. If you think you’ll make further adjustments, make sure you save a layered PSD file as well.